February 2009: The American Recovery and Reinvestment Act of 2009 (the Stimulus Bill) earmarked $4.35 billion for the Department of Education. Education dedicated the money to its Race to the Top (RTTT) competitive grant program open to the states. April 24, 2009: Supt Luna and Governor Otter apply for State Fiscal Stabilization Fund (SFSF) grant with its four assurances. January 13, 2010: Idaho Submitted Race to the Top 1 (first round) application, committing to Education Reforms. Application notes that Governor Otter signed it. It commits the state to the U.S. Department of Education’s reform system which include adopting the Common Core State Standards, assessments, data collection, etc. March 12, 2010: National Governors Association and Council of Chief State School Officers release first draft of Common Core State Standards. May 10, 2010: Phase II SFSF application signed. How is state meeting four assurances? May 14, 2010: Luna announces that ID will not apply for RttT2 due to the short timeline, etc. June 2, 2010: NGA and CCSSO Release Final Draft of Common Core State Standards. June 2, 2010: Presidents of Idaho’s Institutes of Higher Education sign a “Letter of Intent for Institutes of Higher Education.” Any student graduating passing the summative Common Core assessments guaranteed to be placed in credit bearing college courses. No remedial work will be needed. August 11-12, 2010: Idaho State Board of Education adopts Common Core Stated Standards. January 24, 2011: Idaho completes its adoption process for the Common Core. That process entailed (according to the 1/24 state Dep’t of Ed press release): (1) the SBOE initially adopted the Common Core (8/2010), (2) the SBOE adopted it finally (11/2010), and (3) then a legislative committee (Sen. Ed C’ee) voted on it. Mar.-Apr., 2011: Governor Otter signs Students Come First Legislation (S. 1108, 1110 & 1184). “Obtion B.i: The state of Idaho adopted the Common Core State Standards officially during the 2011 legislative session…..Idaho will have full implementation of the Common Core State Standards by 2013-2014. So what the ID institutes of higher learning has promised is that Common Core graduates will get college credit immediately without taking remedial (non-credit bearing) courses. In other words, they will get college credit even if the courses amount to remedial learning. It is a dumbing-down of the state higher education system. 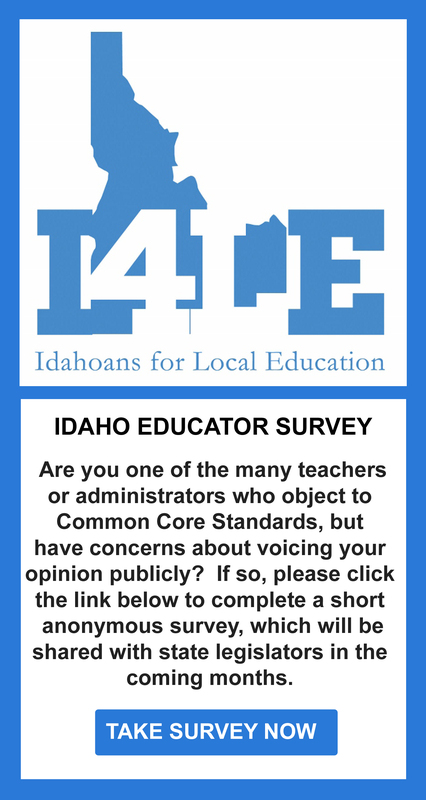 Idaho has been involved in the development of the Common Core State Standards since 2008. Idaho Superintendent of Public Instruction Thomas Luna served on the board of directors for the Council of Chief State School Officers (CCSSO) and was active in promoting a voluntary, state-led effort to develop the common core standards. Idaho adopted the Common Core State Standards in February 2011 with approval from the Idaho State Board of Education (“State Board”) and Idaho Legislature. November 7, 2012: Idaho voters send a resounding NO on Students Come First or Props 1,2,3 (SB1108, 1110, 1184).